The best trade show exhibit builder for your displays is not an easy choice. The wrong decision could mean you will be wasting your money. Ending up with a poorly designed exhibit booth for your company and products will mean a dismal result from your efforts. There are some questions and considerations that can help you make the best possible decision with your budget and your business. 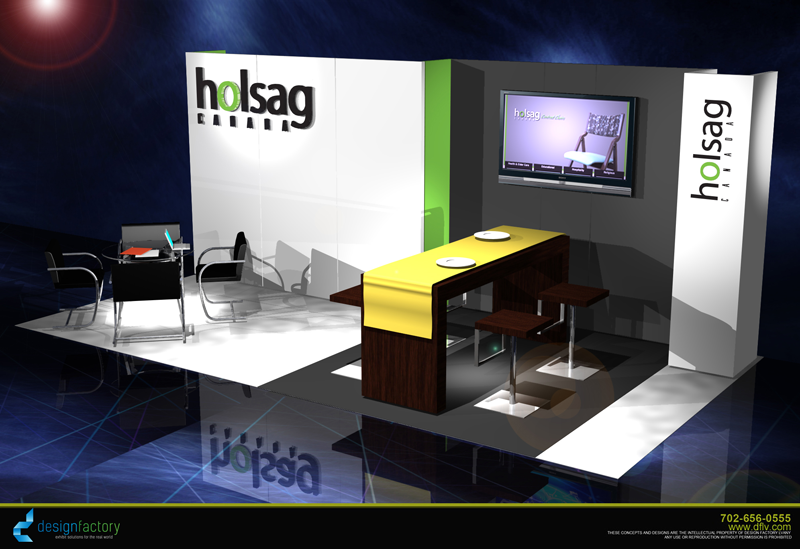 The Design Factory is the trade show exhibit builder for this custom, modern exhibit for Holsag Canada. 1. Which trade show exhibit builder has considerable experience in this industry? You want a person or company that has a considerable amount of experience in this area so that you get exceptional results and exhibits that are attractive and highly appealing. Ask how long they have been in business, how many displays and booths they handle each year, and how many repeat customers they have so you get an idea of whether the business is well qualified. 2. Will the builder help with booth design aspects? Some companies that specialize in building exhibits do not handle any aspect of design; they simply take your specifications and then create what you have imagined. Others will offer a complete range of services to cover every aspect of the design and creation of your displays and exhibit components so everything is handled for you. 3. Who will actually build your display? A common misconception is that the trade show exhibit builder you hire will always be the one who builds your displays, but this is not always true. Some of the businesses in this industry may contract the work out to subcontractors, and you could end up with someone you have never interviewed or compared working on your project. 4. Can the company provide references? Any trade show exhibit builder who cannot provide references for the services that you want should be eliminated from consideration. If you want booth design, then make sure that you get references for this service, not ones that talk about building skills or unrelated aspects of the project. Verify the references before you finally hire the company. 5. Does the company have a website? Any reputable trade show exhibit builder will have a website that you can visit and check out. If this is not the case then the company is probably not the best choice. Creating a website shows that the builder is not just in the business for a short time, they plan to stick around enough to invest in a website for potential customers to view. 6. Does the trade show exhibit builder have a portfolio? If you are interested in booth design services then pay close attention to the portfolio that the business provides. This will help you see what the company has done in the past and will give you an idea of whether they can deliver on the exhibits that you want created. Take a look at a few of the trade show exhibits created and built by the Design Factory here. 7. What time line is involved for your displays? Even the best trade show exhibit builder may be the wrong choice if they cannot deliver by the deadline that you have. You should start talking to builders as soon as you realize that you will be exhibiting at an event, usually six months to a year minimum before the event will be held. This will ensure that you have plenty of time and your exhibits will be completed when you need them. 8. Is the price within your budget and includes shipping and other costs? Look at the cost for the booth design or other services and determine whether the price will fit in your budget or if it is too much. Avoid going with the lowest cost without looking at all of the other important factors as well. Going cheap could cost you dearly in the end if you end up with a poor quality booth or little appeal to the visitors. Don’t forget shipping and transportation to the trade show venue…and who will set up the exhibit? These are important things to know and can add on considerably to your final cost. Oversized or heavy displays can be very expensive to ship to the trade show, and may also require that you hire expo personnel to bring them into the exhibit hall and help you set them up. 9. How much time will the builder spend going over everything? When you hire a trade show exhibit builder they will need to take some time with you to understand what you are looking for and get a basic idea of your company and product goals. If a potential business is only willing to spend a few minutes on this then you will not usually get the best possible results. 10. Does the trade show exhibit builder have a brick and mortar location? As mentioned in #3 here, some companies merely sub-contract out the work to build exhibits. Some of these businesses do not even have a brick and mortar location. Don’t assume just because a trade show exhibit company has a pretty website and looks official that they are a full-fledged business. Be sure you are working with the actual trade show exhibit builder that will design and construct your exhibit. If possible, ask to schedule an on-site meeting to find out just what sort of business you will be dealing with. What do you evaluate before you choose a trade show exhibit builder and why?